Sharon was struggling to find brass finish bathroom hardware, because apparently Rejuvenation and House of Antique Hardware have determined that all bath hardware must be chrome or nickel! After many hours of searching, she finally found a really cute unlacquered brass toilet paper holder, thanks to a link provided by the 1915 Craftsman Bungalow blog. The link was for DEA Bathroom Machineries. It just got installed today and she is really delighted with it! 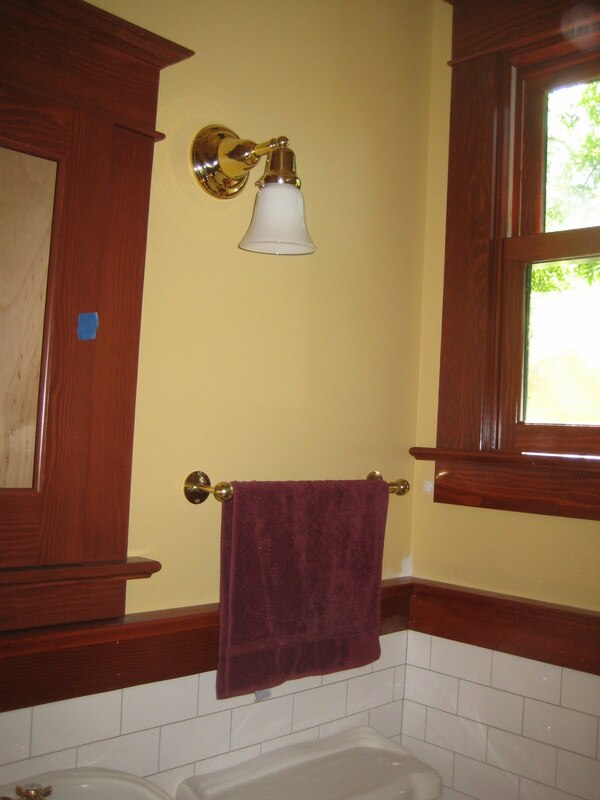 She also ordered a brass towel holder that appeared period appropriate. The hooks were also installed in the coat "nook" near the entryway. The hardware installation in the kitchen is still ongoing. We're told the kitchen should be done on Monday!